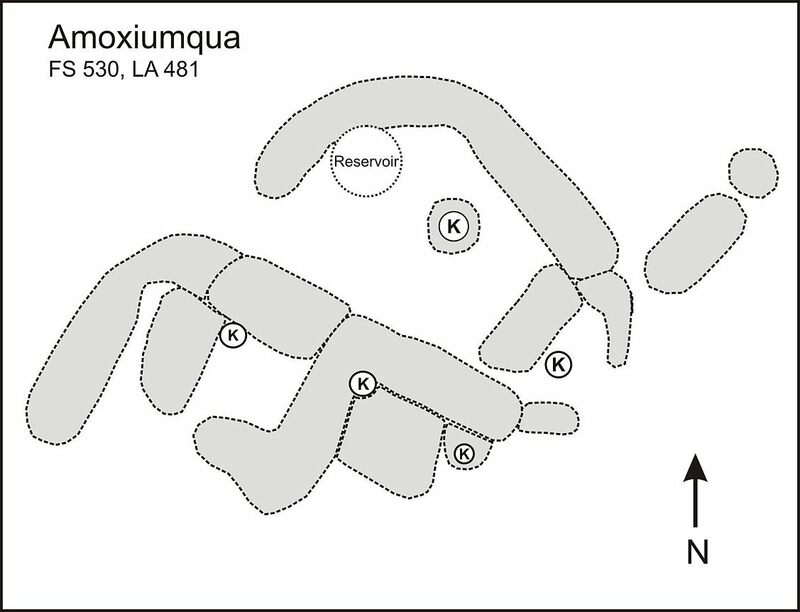 Amoxiumqua means “Old anthill place”. Seeing as how I found anthills all over the Jemez, I can’t see what’s special about this particular spot to earn that name. Amoxiumqua has been repeatedly studied but never fully excavated. It’s a big and sprawling place, with perhaps 1,200 rooms and portions up to four stories in height. Only one tree ring date has been retrieved, putting it at 1502 AD, and ceramics suggest an occupation period of from 1350 AD to 1650 AD. 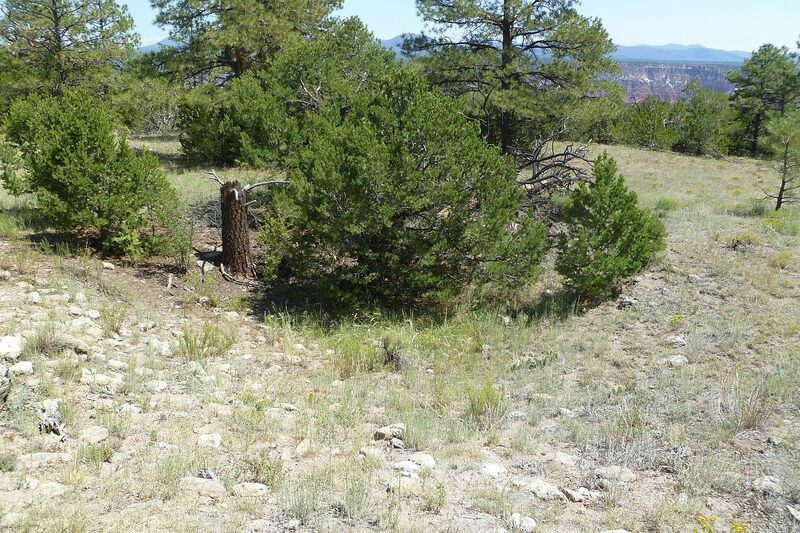 It is the last of the “big three” Jemez mesa top settlements I visited, the other two being Tovakwa and Kwastiyukwa. Ruins of Amoxiumqua. 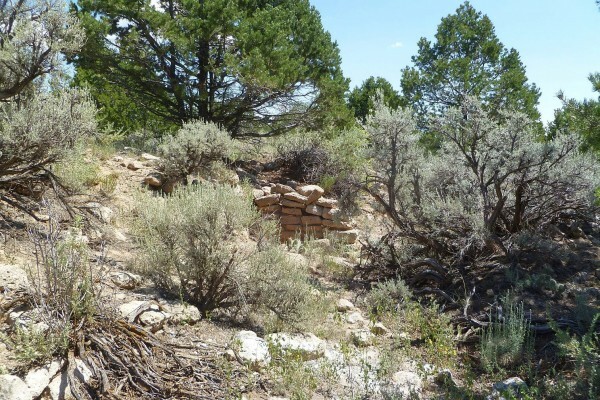 — On the high mesa overlooking Jemez Hot Springs on the west are the remains of another large and ancient pueblo, which is reached by a tedious and very precipitous trail. The ruin, a sketch plan of which is given in figure 10, stands in an open space in the forest, about a quarter of a mile from the brink of the canon, and from its walls a glimpse can be had of the lower valley of Jemez creek. It is larger than any of the ruins in the valley below, and appears to represent two periods of occupancy, an ancient or pre-Spanish one, and a more modern one, probably of the Spanish period, the later village having been built upon the ruins of the earlier. Bandelier states that Amoxiumqua was abandoned previous to 1680. 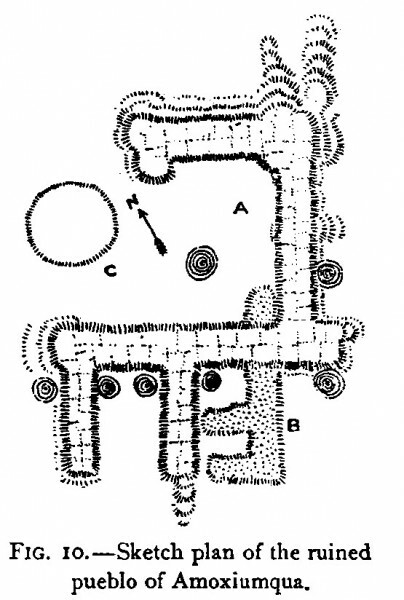 In the accompanying sketch plan (figure 10) the old town, which is a mere heap of debris and quite limited in extent, is indicated by a stippled or dotted surface. The newer construction consists of a series of connected ridges, two or three rooms in width and from a few feet to eight or ten feet in height. Some of the room interiors are exposed and still retain the coatings of plaster, and the ceilings are of logs with transverse layers of brush or splinters to support the earthen covering. The stones of the walls, which have been derived from the cliffs in the vicinity, are rather even in size, and have been in cases slightly dressed on the outer surface. The length of the ruin from northeast to southwest is about 350 yards, and the greatest width is some 200 yards. The rows of ruined buildings have a width of from 20 to 30 feet. Seven circular kiva-like depres¬sions are associated with the ruin. Six of these are approximately 20 feet in diameter, and the sixth, a part of the encircling wall of which is intact, is 32 feet in diameter. On the side opposite the canon is a large depression, 150 feet in diameter and five or six feet deep, which contains a pool of water, and was undoubtedly used as a reservoir. The potsherds are very numerous on this site, and cover the ground for many hundreds of feet around the ruin, extending far down the slope into the timber on the south and west. In the older ruin none but the archaic varieties were observed, and these predominate over the entire site. They include the coiled ware, the white ware with decorations in black, thin black ware, and red ware. The white archaic ware comprises nine-tenths of the fragments, and is uniform in nearly every respect with the prevailing variety of the San Juan valley. The more recent vari¬eties include, especially, the glazed ware, which is uniform in character with that from many other sites of the general region. Metates and mullers of usual form were observed, and arrowpoints and other flaked objects of obsidian and agate are common. A few scraperlike forms were collected. For all that I can’t say it was a site that really impressed me. Not sure why, other than it was rather overgrown and thus not apparent how large it was. The other two biggies I visited were much more impressive. A panorama of Amoxiumqua. Not too awe inspiring. 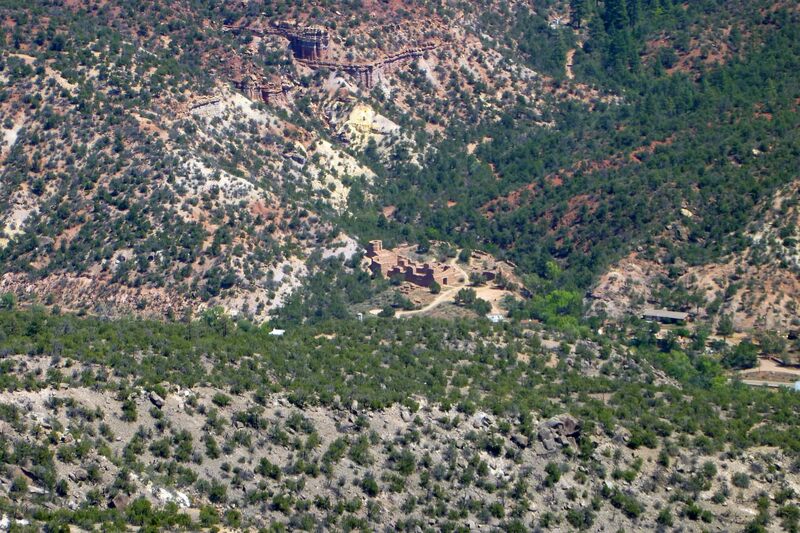 One of the kivas at Amoxiumqua. No really, it is! Another kiva, equally impressive as the first! But what I was really interested in was only about 400 meters to the east of the site. It was quite a view! 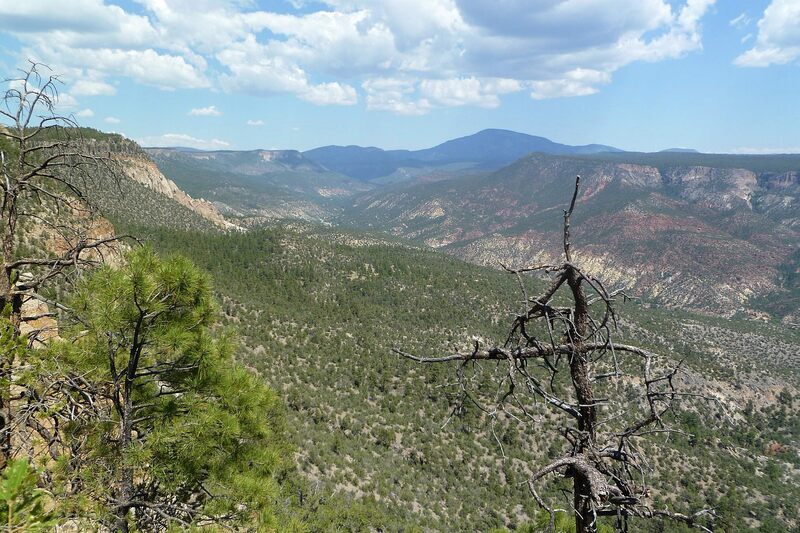 Looking northerly up canyon from Jemez Springs. As I turned from the edge of the world to return to the ruins, I saw a flash of orange nearby in the brush. I went over to check it out. To my surprise, this is what I found. WTF? A trail marker? What sort of madness is this? I went down the “trail” a bit and it looked like it went on. It was clearly not a nice, maintained trail, but what is often called a “use trail”. That’s a trail that’s somewhat informal and only visible because people use it. It was clear that it descended to Jemez Springs, but I had no idea where. But I was more than a little interested. It would be a cool hike! 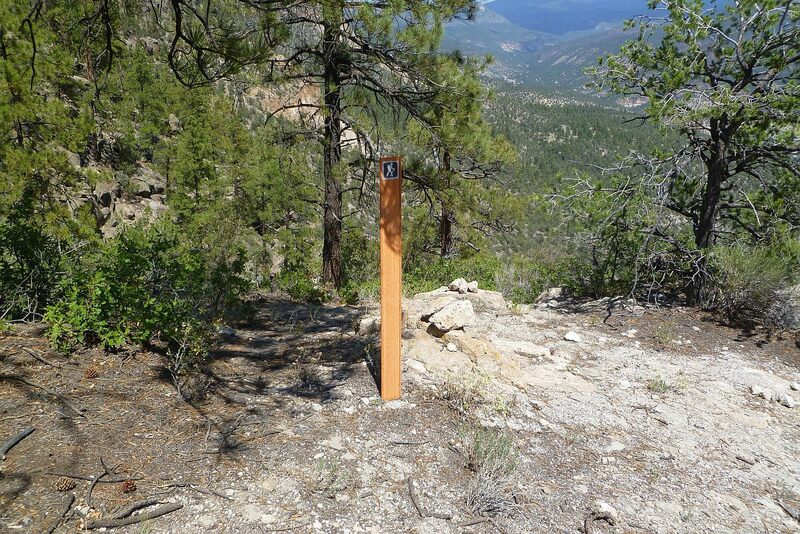 Turning around, I went back up the trail, and was further surprised to see this on the back of the trail marker. 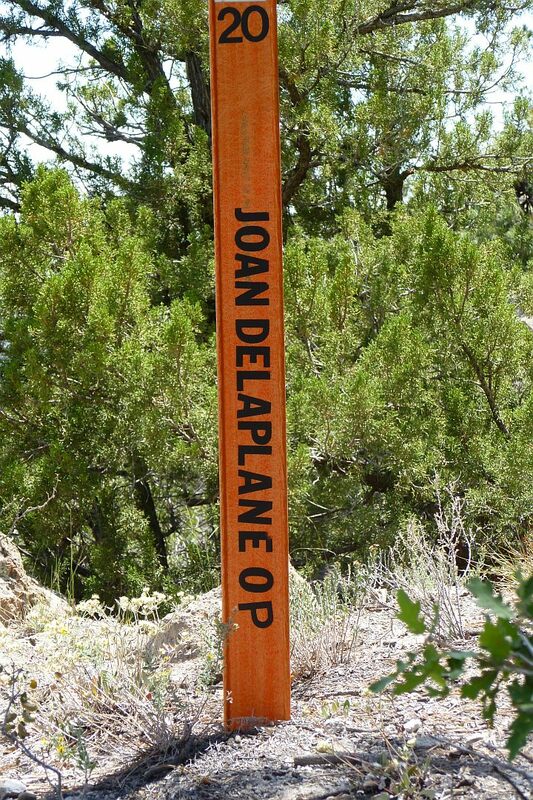 The strange notation on the back of the trail marker. I sense this isn’t official forest service stuff. Now THAT was odd. Later Googling the name and “OP” turns up a Dominican Sister by that name, so perhaps it was associated with one of the religious institutions down below in Jemez Springs. You may have noticed I have been less circumspect in this writeup as to where this ruin is located. From the pictures, it’s pretty obvious. 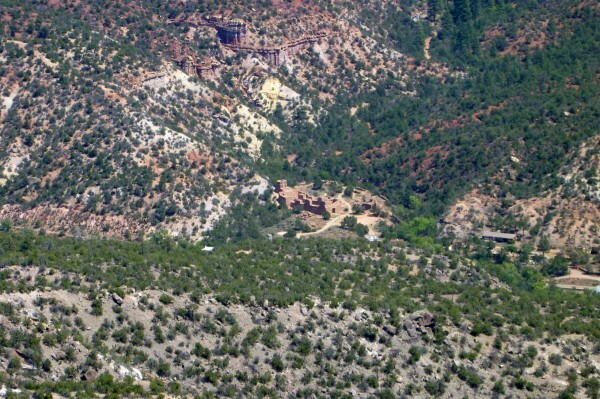 I mean, if you can’t figure it out by looking down on Jemez Springs, well there’s little hope for you. I did this for a couple of reasons. First, knowing where it is doesn’t mean you can get there. This one was a challenge in navigation. I travelled nasty 4wd routes that weren’t on any maps. I could only work it out using aerials in advance. Secondly, people have put access info online, to the extent it’s correct. But they were using quads which can go pretty much anywhere, and good GPS navigation skills are still required. So the difficultly of access still protects this site, much more than some other Jemez sites. 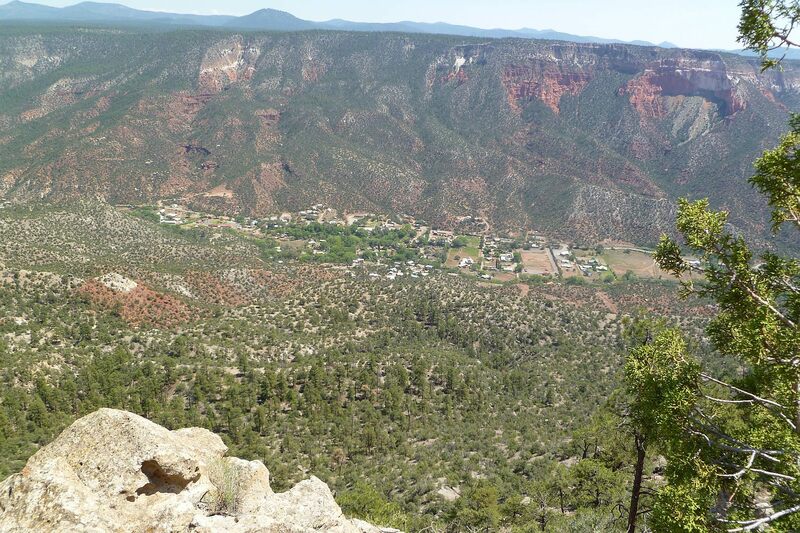 Of course there’s always that hiking trail from the bottom…..